Haiti is governed by a small economic elite and the majority of its poor and marginalized population has no access to power. 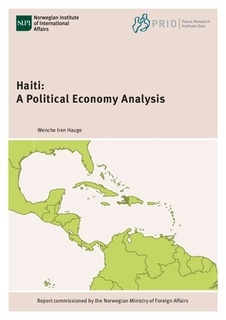 This report analyses the historical roots of the deep socio-economic and political cleavage in Haiti and the consequences of repeated cycles of foreign interference, economic liberalization policies, increased food insecurity and natural disasters. The report reveals that the elections in 2010/2011 and 2015/2016 only served to exacerbate this cleavage. The elections in 2016 had a record low participation of 17.3%. Many of Haiti’s poor abstained from voting due to lack of confidence in the elections, as well as due to extremely difficult socio-economic conditions post-earthquake in 2010/2011, and post-Hurricane Matthew in 2016. Since the earthquake in 2010, there has been a heavy presence of international actors in Haiti. Whereas several of these actors put pressure on Haiti to hold elections relatively short time after the disaster, most of the foreign actors, and particularly the United States and the EU, showed little concern about fraud and low voter turnout. The elections brought President Michel Martelly to power in 2011 and President Jovenel Moïse to power in 2016, both of them representing the economic elite in Haiti. They invested in agribusiness and special economic zones benefiting the economic elite, but further marginalizing small-scale farmers. These two presidents also succeeded in reestablishing the Haitian Army, an institution with extremely bad reputation in Haiti, due to its past severe human rights violations.